Secretary of Defense James Mattis dismissed rumors Wednesday that he disagreed with President Donald Trump on the administration's decision to launch airstrikes on Syria. 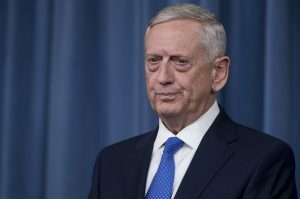 Mattis pushed back on a story that appeared in the New York Times earlier this week claiming the secretary advocated Trump get congressional approval before launching air strikes against targets tied to Bashar al-Assad's chemical weapons program, according to AFP. "I have no idea where that story came from," Mattis told reporters at the Pentagon. The Times article claimed Mattis pushed the president to seek congressional authorization for the strikes, underscoring the importance of building public support. The secretary further added the article did not include anything that reflected the actual occurrences leading up to the strikes. "I found nothing in it that I could recall from my own last week's activities," he said. On Friday, the Trump administration coordinated air strikes with Britain and France in a concerted effort to remove three targets purportedly vital to Syria's chemical weapons infrastructure. The response came after the United States and its allies said the Assad regime carried out a chemical weapons attack last week on a rebel-held stronghold in Damascus. The attack killed dozens in the region and elicited rebuke and consternation from the international community. The strikes have reignited a debate in the United States over the president's authority to use military force, with some lawmakers calling for Congress to pass an updated authority. U.S. forces under Presidents George W. Bush, Barack Obama, and now Trump have largely operated under an authorization for use of military force (AUMF) passed by Congress in 2001 and another passed in 2002.